What makes a home modern? Modern in the sense of style and comfort or modern in terms of practicality and cost? Well for most people who want a modern home, stylish decor and comfortable materials are what they want. However, if you lean too much toward one side what you will get is a loss of practicality and thus the home become too much of an art gallery and no longer functions as it should. And to that end, you’ll spend more money than you would have in the first place to rectify this problem. Therefore, all four are important if you really want the most modern home possible. So installing the things you need is the first way to achieve this on a mass scale so no room in your home is left in the past. Some things will be broad and effect the entire home while others will purely be for specific rooms. Not everything can be used as a blanket technology and thus you have to put a lot of thought into the things you are installing. It’s strange to think that a light in the center of a room can become so sophisticated that it can split off into many different styles. That’s exactly what the modern interior stylists offer homeowners. You can have one giant light that is seen as ‘old school’ or you can have multiple smaller lights that are very shapely. They also have practical features such as the ability to become dimmer at the touch of a button on the wall, or a swipe of the finger on your smartphone. Consider installing pendant lights from the ceiling that droop down to different lengths. Some can be lowered such as over a dining table, while others can be kept short such as over a staircase. Because they are pendant shaped, they spread the light from the bulb out just far enough to keep a consistency. Modern installations will have LED lights so they are powerful and efficient. You cannot say you have a modern home unless you have an air conditioning unit. Sure they may not be as effective at heating a home but they come in handy when you need a little extra warmth. Where they shine is when the summer heat begins to make normal life in the home unbearable. The cool air they supply the home will be incredibly relaxing and provide a lot of relief, especially to children and pets. Consider a company that does modern air conditioning installation. They have products that only have a gentle hum to them and yet, they are powerful to work all throughout the home from just one fixed location. They also give the customer a 24-hour emergency callout service so if anything goes wrong for whatever reason, they will be there in just a few minutes. Lighting is a sure sign of modernity in a home when it’s down right. A unique design and modern practical means will allow the home to have a versatile lighting grid. The pendant shape of the glass is something that has become popular for these reasons. Hair is one of the most important parts of a person. If you are a woman then density of the hair matters even more. Density of hair affects the way your tresses look and feel. It defines your face and style you choose. Density of hair is the volume of hair you have per square inch on your head. The more densely our hair follicles are packed more is the density of hair on your head. Choose available best Nykaa Coupons to buy hair products online. Unfortunately, not everyone has dense and thick hair like some people. While some may have naturally less dense hair others lose hair density due to various factors like pollution and stress. No matter what is the reason for your low density of hair, there are number of ways you can increase it. You can also grab Myntra Coupons to buy hair density products online at best prices. The first and the most basic tip are to improve your diet. Most of the people ignore this not knowing that this is the most essential step. Like your body, your hair follicles too need nourishment. With all the stress, pollution and modern day lifestyle, the hair suffers damages. The right kind of diet will provide your hair follicles with vitamins and minerals needed to restore their health. Include Spinach, walnuts, lentils, oatmeal, eggs, cockles, and yogurt in your diet. Stress can have a very bad effect on your hair follicles. Hair fall, premature graying, dry and brittle hair are some of the signs that stress is affecting the health of your hair. Unless you de-stress the diet and amazing hair products will not have the desired effect. Meditation and yoga can help you de-stress. One of the best remedies for hair nourishment and growth, aloe Vera is a natural solution. It moisturizes your hair and brings shine to it. Massage the gel on your scalp once or twice a week and you will see the difference it can make to the density of your hair. Over the time, the use of Aloe Vera can strengthen the hair follicle. Fenugreek has antioxidants that can reduce hair fall and improve the texture of hair. It has natural elements that can fight radicals that can weaken the hair follicles. Soak the seeds overnight, make a paste and apply it on hair and leave it on for one hour before washing it off. Oil massage is another effective way of increasing hair density. Regular oil massage can improve blood circulation, and prevent hair fall. Opt for oils like coconut, olive, argon, or almond oil to massage your scalp on regular basis to strengthen the roots, and improve the overall health of the air. Vitamin C is very important for your body and hair as well. It provides nourishments and help in increasing the volume of hair. Lemon, kiwi, oranges are some of the food items that are very rich source of Vitamin C. You should include food rich in Vitamin C in your diet to improve the health of your hair. Apple cider vinegar is one of the most effective ways to increase the hair density. It is made from fermented apples and has Ph acid that can do wonders for your hair. Hair acid imbalance is one of the cause for hair loss. With apple cider vinegar you can bring a balance in the Ph level and promote hair growth. You can use the vinegar by consuming it, using it as a hair mask or hair rinse. Heena leaves are one of the oldest hair growth remedies to increase hair density. Hair mask using the heena leaves can make your hair soft, lustrous and dense. You can make heena paste using the heena, oil, eggs, tea, yogurt or coffee. Heena powder is easily available in the stores. Another tip for increasing hair density is using the egg mask. They are rich source of protein and can help you improve the texture of your hair and make it look denser. It can repair the damage and improve the texture. Using the right hair products is important for promoting hair growth. Depending on what your hair needs, hair products can help you improve the health. Find out what your hair needs and use the products specifically designed for the purpose. You can increase the density of hair with right hair care regime. Use the combination of natural as well as hair products to provide your hair with the right care and maintenance system. One of the most difficult decisions a bride could ever make is choosing a wedding theme. Do you want your wedding to be modern or somewhat have that vintage feel? The progress of your wedding planning will depend on how fast you come up with a theme. Don’t get so worked up because there’s a wedding theme guide that you can check out to make your decicion making easier and faster. Having this theme can be lots of fun. You can choose which decade you want, 50’s up to 90’s, or even older and get inspiration from that. One of the easiest ways to channel this is through your wedding outfit, hair, and makeup. It doesn’t matter if you look through expensive wedding dresses or cheap wedding dresses, as long as they’re from the decade you chose. Buy antique-looking decor for your ceremony and reception and drive away in an old car. Think clean lines, geometric shapes, and minimal design. Put a modern touch on anything from your wedding dress (wear anything but white) to your decorations. In a romantic wedding, there should be lots of flowers, soft colors, and fine lighting. Visualize pastels, hanging lights like chandeliers, and a flower wall for this theme. 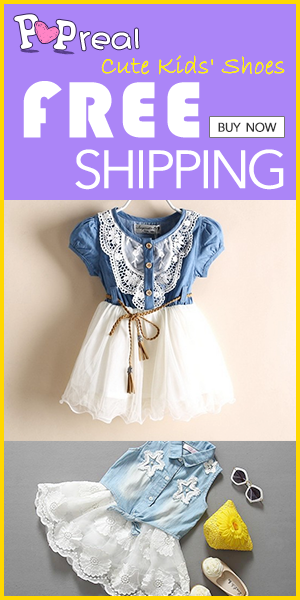 A ball gown wedding dress will be suitable for this theme. 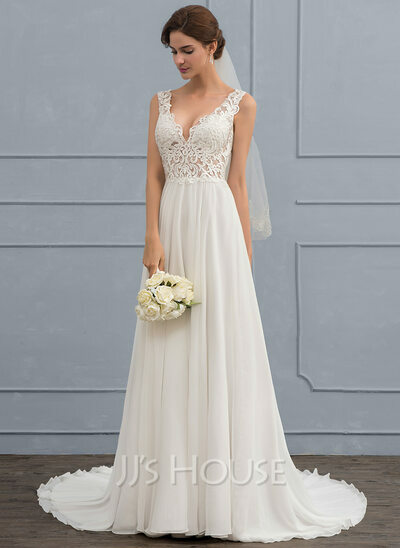 Try shopping online in websites like JJ’s House (Jjshouse.com), the global leading online retailer for wedding gowns, special event dresses, wedding party dresses, and accessories. Go for an outdoor garden party-themed setup if you want a more casual wedding. This laid-back style is also perfect if you’re going to get married during summer. If you want your groom, the entourage, and guests dress to the nines, this is the theme for you. Keep in mind though that everything must be extravagant. From the reception venue to the food, flower arrangements, table setting, cake etc. A bohemian wedding is fun, cool, and carefree. The wedding dress and the attire of the whole entourage must also have that bohemian look. The venue decorations should be simple yet elegant, with decorative pillows and oriental rugs lining the altar as well as the aisle. You can pull off a tropical themed wedding even if you don’t really live in a tropical place. You just have to decorate the venue with a lot of plants like palm fronds and other leaves and flowers. The food too should have something to do with the tropics. As we get older, men specifically tend to lose hair, especially around the hairline and crown. While healthy hair requires healthy body and a nutritious diet, hair loss is something that is bound to happen as we age. It’s okay if you have the hair loss problem because we now have non surgical hair replacement solutions that can instantly give you a full head of hair. Sounds great, right? 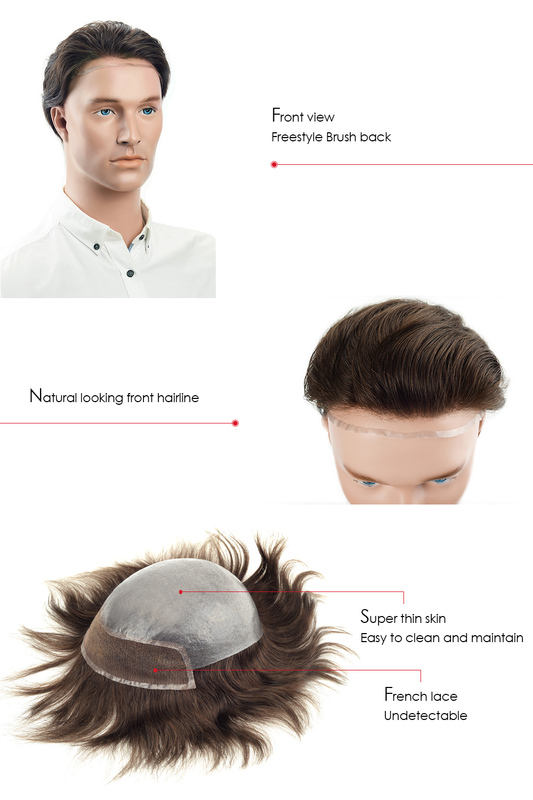 This post will introduce you to the most realistic mens wigs and hair systems available for a very reasonable price. If you are on lookout for non surgical hair loss solutions. I’ll then suggest you to take a look below superb and quality hair systems! Keen to know what are these 5 realistic mens wigs and hair systems that could help your balding problem? These hair wigs and hair systems are truly world class these hair wigs are made meticulously, meaning all of the hair in wigs are installed manually. One of the product I am really eyeing to have was this Full French Lace Stock Hairpieces for Men. This hair system is useful for those who have severe baldness problem especially to the front area of the head. Thus, if you are looking for some, I really encourage you to take a look at this one because they really good when it comes to realistic look. And other best option in my list of 5 realistic mens wigs is this German Lace Man Hair Replacement System. Because this one is also hand crafted and the quality of the wig itself is awesome and a lot of the returning customer were too pleased to have them as the adhesive of the hair system are good and the wig is looking like its your own hair. So, you better check this out as well to get address your balding problem immediately. For the third wigs am suggesting you all guys is this Super Thin Skin Men’s Hair Systems with Lace Front. If you wanna achieve a super natural look with your wig, then, this is the one I would recommend highly. Though, all the wigs mentioned has the natural feel, this one is the most natural as it has a thin layer on the front which could give a illusion as it was the hair planted to your skin itself. For those people who are in need for the full coverage for their baldness, I really suggest you all to have any of these, Lace Base With Poly Coated Perimeter Around Hair System or Swiss Lace Grey Hair Toupee for Men Dark Brown mixed 10% Gray because they have the most natural colored hair. Stock wigs is not something I highly recommend. To make the wig or hair system look like the real deal, you need to invest in a custom hair system. Lordhair is a nice brand to buy from. They have pretty solid catalog of custom hair replacement systems. I came across their blog during research and they have pretty good guides for first-time buyers. Check it out over here. Have a great holidays, guys! As the New Year approaches, we tend to start thinking of new goals and bad habits we’d like to change for the coming twelve months. And one of the most popular is usually to go with money. A lot of people tend to overspend at Christmas, leaving them in a bad financial position. Overspending is certainly a way of life for some, and never being able to make it to the end of the month without running into your overdraft is a depressing state of affairs. What Is The Lifestyle You Can Afford? The key is not to think of how you can get that shiny new car or luxury holiday, but instead to ask yourself what you can afford within your means. The answer is not a lottery ticket. It’s not browsing kaszinohu.com hoping for a win on blackjack. It’s not borrowing more to fund an unsustainable lifestyle. It’s quite simply redrawing the lifestyle you have to fit within your means. Financial problems like this start because we are out of touch with the reality of our money situations. We’ve ignored the basic facts of income vs outgoings. It’s time for a reassessment. Looking at the past month’s budget isn’t sufficient because it doesn’t tend to take into account large annual expenses such as Christmas, the summer holidays or when the car needs servicing. These are the triggers that can often push us into bad debt. At this stage, gaining an annual picture of your finances is far more helpful. Set aside a couple of hours to create a budget planner based on what you have really been spending over the past twelve months. Then, make sure your accounts are set up in such a way as will help you to manage your finances. Set up one account that your salary is paid into and your essential bills, such as utilities, come out of. Then, set up a second, linked current account, into which you’ll deposit a set amount each month – this is for things like meals out, clothes etc. Having it in a separate account with no overdraft facility means you can’t accidentally overspend. Finally, also set up a higher interest, lower access savings account. This is your long term pot of savings to enable you to meet your financial goals – saving for a house deposit or even retirement. Lastly, you may also want a secondary savings account with quicker access – this is your emergency fund for unexpected larger expenses such as car repairs. If all the accounts sit with the same bank, it’s easy to move money around online. By having that separate account for daily spending, and only taking that card around with you, you make it a lot harder to overspend and impulse buy by dipping into the money you need for essentials. Another method which is popular with some is to withdraw a set weekly spending amount in cash and consign the plastic to a drawer at home.